The Rheem Performance Line. Exclusive to the Home Depot! A 60 gallon gas water heater providing an ample supply of water to households with 5 - 6 people. This model has a 12 year limited tank and parts warranty plus a 1 year in home labour warranty. Featuring a Honeywell, self powered, (no electrical connection required) gas valve with self diagnostic capabilities that alerts the user to the operating status of the unit. A brass valve upgrade for superior leak protection. 50 000 BTU input for exceptional hot water delivery. Want better efficiency, limitless hot water, and space savings? Consider Rheem condensing tankless (SKU # 1000730128). 60 gal. tank provides ample hot water for households with 5 or more people. Honeywell, self powered, self diagnostic gas valve. Alerts the user to the operating status of the heater. 12 year tank and parts, 1 year labour limited warranty. Meets and exceeds NRCAN efficiency standards. 50 000 BTU input for fast water temperature recovery. 12 Year Limited Tank and Parts. Rheem Exclusive First Year In Home Warranty. 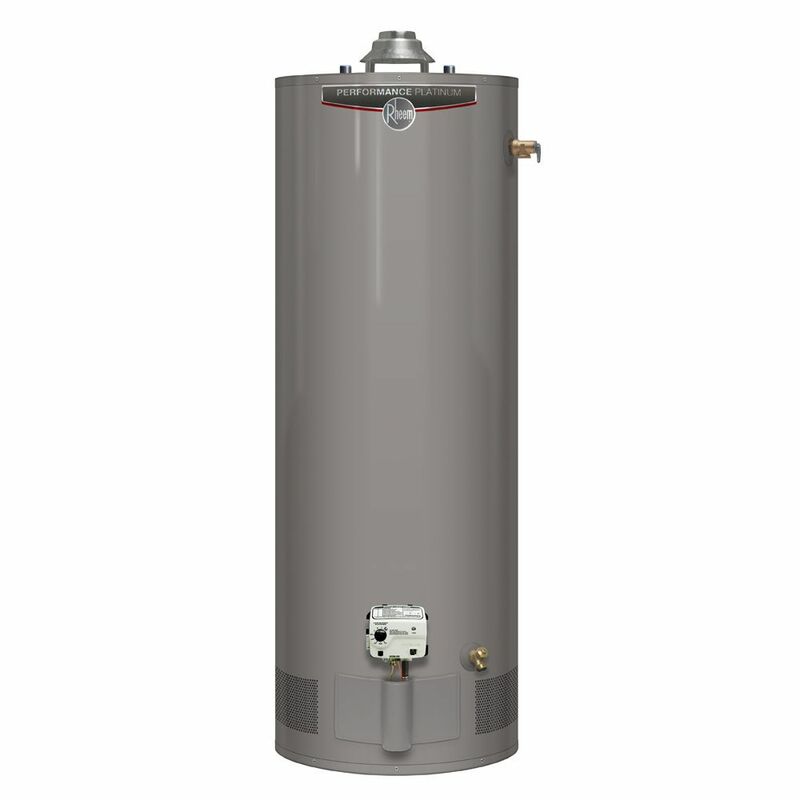 Rheem Performance Platinum 60 Gal Gas Water Heater with 12 Year Warranty The Rheem Performance Line. Exclusive to the Home Depot! A 60 gallon gas water heater providing an ample supply of water to households with 5 - 6 people. This model has a 12 year limited tank and parts warranty plus a 1 year in home labour warranty. Featuring a Honeywell, self powered, (no electrical connection required) gas valve with self diagnostic capabilities that alerts the user to the operating status of the unit. A brass valve upgrade for superior leak protection. 50 000 BTU input for exceptional hot water delivery. Want better efficiency, limitless hot water, and space savings? Consider Rheem condensing tankless (SKU # 1000730128).